The time-honored modality for assessment of hemodynamics of congenital heart disease (CHD) is cardiac catheterization. Over the last few decades, with the emergence of accurate echocardiography, the routine use of cardiac catheterization to assess hemodynamics prior to surgery has diminished considerably. In many institutions, cardiac catheterization is largely reserved for assessment of flows and resistances in single ventricle physiology prior to the Fontan operation and selected patients with shunt lesions and elevated pulmonary vascular resistance who are considered borderline candidates for surgical correction. The limitations of cardiac catheterization are widely understood. The most significant limitation is in its ability to calculate flows with accuracy particularly because crucial data are assumed (oxygen consumption, pulmonary venous saturations). However, it is the only modality that allows us to quantify pressure (especially mean pressures) with accuracy. Cardiac magnetic resonance (CMR) imaging was initially introduced to improve anatomic definition of heart and great vessels. This has brought about a revolution and virtually eliminated the need for invasive angiography to define structural alterations in CHD. More recently, it has become apparent that CMR has extraordinary potential in revealing accurate physiologic information that is often not possible through any other available modality. One of the most striking advantages of CMR is in its ability to precisely quantify flows in any given location in heart and major blood vessels. It is possible to perform internal validation and ensure that all estimations are accurate. This case is being presented as an example of how CMR can allow us to understand the physiology of a complex situation with relative ease. We describe a 12-year-old boy with single ventricle, pulmonary stenosis, interrupted inferior vena cava (IVC), who previously underwent a bidirectional glenn shunt (The Kawashima operation). Flow across the pulmonary valve was preserved ("Pulsatile Glenn"). The patient was diagnosed to have complex cyanotic CHD in infancy - situs inversus, dextrocardia, common atrio-ventricular (AV) canal defect, large ventricular septal defect nearly amounting to single ventricle, double outlet right ventricle, L-malposed great arteries, significant valvar and subvalvar pulmonary stenosis, interrupted IVC with azygous continuation and bilateral superior venacava (SVC). Pulmonary venous drainage was normal. Aortic arch was right sided. 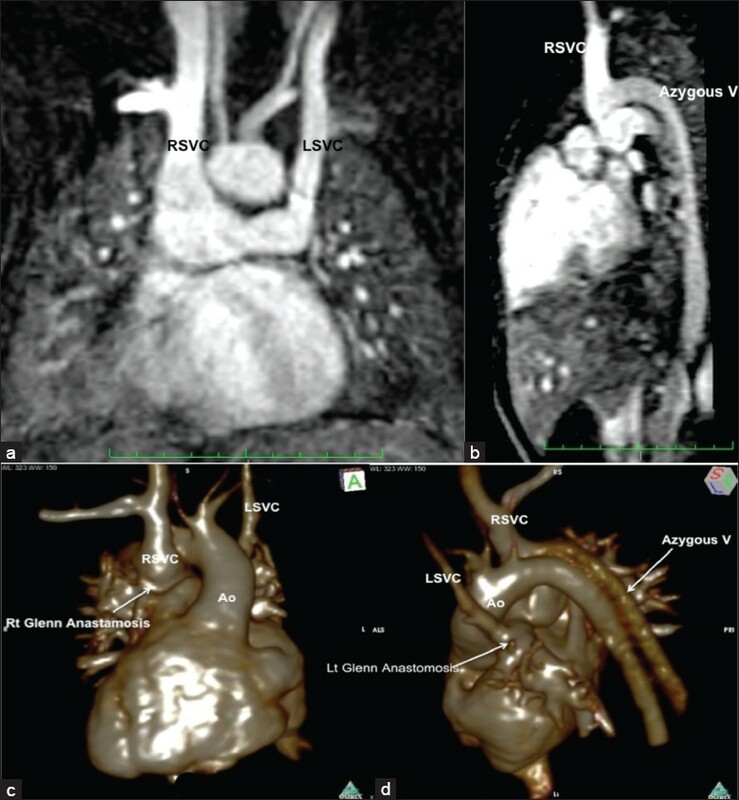 Bilateral bidirectional Glenn shunt (Kawashima operation  ) at 1 year age was done, thereby directing the flows from both the SVCs and the azygous vein into the pulmonary arteries. The hepatic veins continued to drain into the left-sided morphological right atrium. Patient has been clinically well following the surgery (New York Heart Association functional class I), with oxygen saturations ranging from 85 to 90%. He underwent periodic reassessments by echocardiography and was found to have unobstructed Glenn shunts, demonstrable forward flows across the stenosed native pulmonary valve, moderate regurgitation of the AV valves, and normal ventricular functions. He was re-evaluated for suitability for Fontan completion. 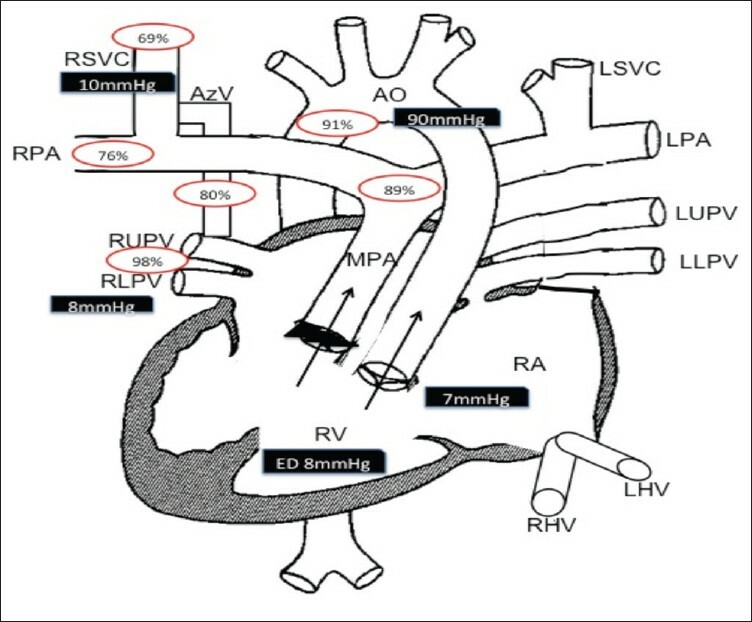 Apart from anatomical suitability [especially pulmonary artery (PA) anatomy and arborization patterns, IVC position, aorto-pulmonary and venous collaterals], critical hemodynamic data required for determining suitability for Fontan surgery included estimation of the shunt (Qp/Qs), mean PA pressures, calculated indexed pulmonary vascular resistance (PVRi), ventricular functions (systolic function and diastolic), and the quantum of AV valve regurgitation. Transthoracic echocardiogram provides good anatomic assessment of the cardiac anatomy (subject to adequate ultrasound windows). 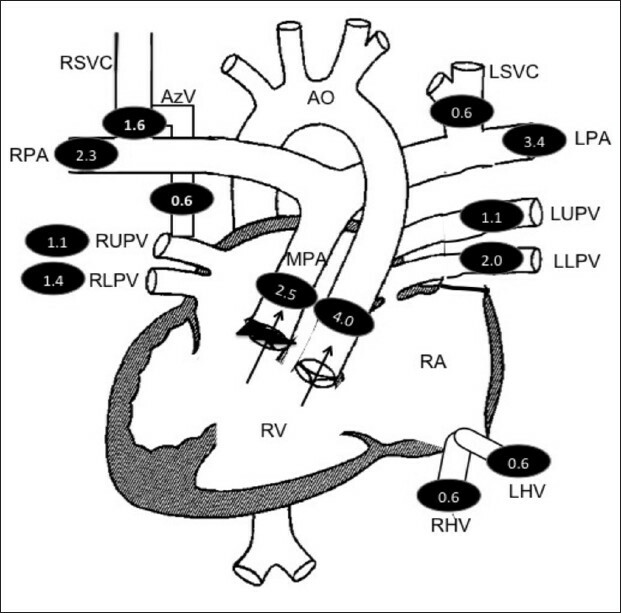 It also provides a semi-quantitative estimate of the common AV valve regurgitation. Assessment of the ventricular function is challenging in view of the large ventricular septal defect (VSD), functional single ventricle and the abnormal cardiac situs and axis in this situation. Though theoretically possible, estimation of Qp/Qs ratio on echocardiography is cumbersome and fraught with assumptions of outflow anatomy and geometry. Additionally, in this particular case, there were three sources of pulmonary blood flow, making it virtually impossible to calculate pulmonary blood flows. Cardiac catheterization is the "gold standard" for assessing absolute PA pressures, PVRi and ventricular end-diastolic pressure (EDP), and also provides critical anatomical information especially of the extra-cardiac structures - sizes of the branch pulmonary arteries, decompressing venous collaterals, aortic arch anatomy, aorto-pulmonary collaterals, etc. Limited intra-cardiac anatomic details may also be obtained by angiography. However, there are definite drawbacks to assessment of the flow dynamics by catheterization using the Fick's principle. First and foremost is the fact that the calculations are based on assumed oxygen consumptions. Secondly, in the presence of antegrade PA flows with a bilateral Glenn shunt and a large azygous vein draining into the low right superior vena cava (RSVC ), the precise site of oximetry sampling for the mixed venous blood and the mixed PA blood may directly affect the calculated Qp:Qs. The antegrade PA flow that comprises a mixture of saturated pulmonary venous return and the hepatic venous blood will be expected to have much higher oxygen saturation than the returns from vena cava, and the PA saturations would be affected by the quantum of this flow as well as the streaming patterns. The ideal PA sample would need to be a perfect mixture of the blood from venacavae and the antegrade PA flow. The patient underwent cardiac catheterization nevertheless and the information obtained is shown in [Figure 1]. What is immediately noticeable is the varying SO 2 between the RSVC, right pulmonary artery (RPA) and the PA confluence, reflecting the fact that obtaining a precise mixed PA sample for oximetry is challenging in this situation. Consequently, accurate Qp:Qs estimation would be difficult, and is dictated by what we assume to be the mixed PA SO 2 . Magnetic resonance imaging (MRI) is rapidly becoming the premier imaging modality in the assessment of form, function and flows in CHD. Rather than being a single modality, CMR is an amalgamation of several techniques. Each of these techniques can not only contribute individually to the understanding of anatomy and/or physiology, but also complement the other techniques, adding to the information obtained, and/or providing a mechanism for internal validation. Let us discuss the application of CMR in the assessment of the patient described above. This technique provides echocardiography-like moving images allowing dynamic assessment of the cardiac structures including the cardiac contractility, regional wall motion, valve functions and blood flows. The views can be tailored and customized to provide the specific information required. Moderate degree of regurgitation of the common AV valve was observed. Ventricular short axis views obtained in this patient allowed contouring of the endocardial borders of the ventricles in end-diastole and end-systole, providing the systolic function, stroke volume, and cardiac output. This technique allows "true" 3-dimensional tomography and is an excellent imaging modality for the extracardiac anatomy. In the case described, the technique provided detailed anatomy of the cardiovascular structures including the pulmonary arteries, aortic arch and branching pattern, pulmonary venous anatomy, as well as the Glenn and systemic venous anatomy. Unobstructed Glenn anastamosis, absence of significant aorto-pulmonary or venous collaterals were noted [Figure 2]. This technique is based on the principle that moving tissue within a magnetic field changes phase after a radiofrequency pulse imparts energy to it [Figure 3]. It yields a time-flow curve by summing up the flows across the vessel in question in all phases of the cardiac cycle, integrated area under the curve providing the flow during one heart beat [Figure 4]. Multiplying this by the heart rate gives the flow across the vessel per minute. Aorta (at the level of the sino-tubular junction). Main PA [mid main pulmonary artery (MPA) level]. RPA (just beyond the RSVC anastamosis). Left pulmonary artery (LPA; just distal to LSVC anastamosis). Pulmonary veins - right upper, right lower, left upper, left lower. Hepatic veins - right sided, left sided. Ventricular volumetric assessment shows the total cardiac output (diastolic volume minus systolic volume, multiplied by the heart rate) to be 7.8 L/min. Phase-contrast studies show the antegrade flows into the aorta and the stenotic main PA to be 4 L/min and 2.5 L/min, respectively. Subtracting the sum total of the actual cardiac output (aortic + MPA flows) from the cardiac output calculated from ventricular volume indirectly gives the AV valve regurgitant volume, viz., 1.3 L/min, or a regurgitant fraction of 17%. Systemic flow (Qs) equals the aortic outflow (in the absence of significant aorto-pulmonary collaterals) = 4 L/min. In the absence of significant decompressing venous collaterals to pulmonary veins, Qs can alternatively be calculated from the sum total of the systemic venous return (RSVC + LSVC + hemiazygous vein + hepatic veins) - 3.8 L/min. Total pulmonary venous return would reflect the total pulmonary blood flow (Qp) = 1.1 + 1.4 + 1.1 + 2 = 5.6 L/min. Pulmonary blood flow would be equal to RPA + LPA flows = 2.3 + 3.4 = 5.7 L/min. Pulmonary blood flow (Qp) would also be the sum total of the flows across the RSVC, LSVC, hemiazygous vein and the antegrade PA flows = 2.8 + 2.5 = 5.3 L/min. Since all the systemic venous return with the exception of hepatic veins and coronary veins contributes to the pulmonary blood flow, Qp can also be derived if we just consider the aortic outflow and the hepatic venous return (Qp = aortic outflow - hepatic venous return + antegrade PA flows = 4 - 1 + 2.5 = 5.5 L/min). Flow studies show the hepatic venous contribution to systemic venous return to be 25%. Thus, Qp: Qs = 5.6/4 = 1.4:1. RPA: LPA flow ratio is 0.7. As we see above, flow assessment by phase-contrast MRI gives accurate assessment of hemodynamics even in complex anatomical and physiological situations, with excellent reproducibility. It also allows for internal validation of the information obtained through direct calculations, or derivations, from different data sets. Combination of phase-contrast and volumetric data also provides insight into the hemodynamics (AV valve regurgitant volume and fraction in this case) and also a means for internal cross-validation. Differential pulmonary blood flows obtained through CMR bear excellent correlation with flow ratios obtained through nuclear medicine scans. 1. Kawashima Y, Kitamura S, Matsuda H, Shimazaki Y, Nakano S, Hirose H. Total cavopulmonary shunt operation in complex cardac anomalies: A new operation. J Thorac Cardiovasc Surg 1984;87:74-81. 2. Feltes TF, Bacha E, Beekman RH 3 rd , Cheatham JP, Feinstein JA, Gomes AS, et al. Indications for cardiac catheterization and intervention in pediatric cardiac disease: a scientific statement from the American Heart Association. Circulation 2011;123;2607-52. 3. Sanz J, Kuschnir P, Rius T, Salguero R, Sulica R, Einstein AJ, et al. Pulmonary arterial hypertension: noninvasive detection with phase-contrast MR imaging. Radiology 2007;243:70-9. 4. Gan CT, Lankhaar JW, Westerhof N, Marcus JT, Becker A, Twisk JW, et al. Noninvasively assessed pulmonary artery stiffness predicts mortality in pulmonary arterial hypertension. Chest 2007;132:1906-12. 5. García-Alvarez A, Fernández-Friera L, Mirelis JG, Sawit S, Nair A, Kallman J, et al. Non-invasive estimation of pulmonary vascular resistance with cardiac magnetic resonance. Eur Heart J 2011 [In Press].